In chapter 702, we see Ace's Devil Fruit 'Mera Mera no Mi' being showcased as the prize of the event held in the Colosseum. The announcer of the event mentions that the "fruit is reborn." 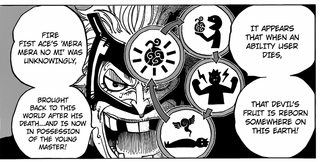 Does it mean every Devil Fruit has that ability to be reborn once the user dies, or is it an artificial Devil Fruit made by Doflamingo's factory? When a Devil Fruit user dies, their ability is reborn into another fruit of the same kind. Instead of growing from a plant, the ability simply regenerates inside the closest appropriate fruit, as seen when Smiley "died" and the Sara Sara no Mi, Model: Axolotl transplanted itself into a nearby apple. Another characteristic of a Devil Fruit's growth is that the stem becomes noticably curlier than it was when the fruit was not endowed with the ability. So, in other words, the Devil Fruit "respawns" when the user that had it dies. I'm not sure why Robin's answer was not accepted, but it has indeed been long confirmed that Devil Fruits re-appear after the user dies. On the other hand, whether artificial Zoan fruits re-appear has not been confirmed at the time of writing. In chapter 676, it was the first time we could see a fruit re-spawn. When Smiley dies, we can see the nearest apple change form into the Salamander fruit, model Axolotl, which was the fruit that was injected into the poisonous H2S gas, creating Smiley. It seems like at least all pirates related to Donquixote Doflamingo know about this process, as Caesar put a bag of apples on the sledge on purpose, commented that he will meet Smiley again. In chapter 703, it was then finally confirmed that Devil Fruits do indeed re-spawn after a user dies. When Luffy and Franky were interrogating one of Doflamingo's underlings, he revealed that the Fire Fruit would be put up as the price for the Colosseum contest. He then confirmed that a fruit can exist only once and that they are indeed reborn, making this Fire Fruit, Ace's Fire Fruit. The Devil's fruit... It is said two of the same kind can't exist at the same time. However... It appears that when an ability user dies, that Devil's fruit is reborn somewhere in this earth! Fire fist Ace's Fire Fruit was unknowingly, brought back to this world after his death... And is now in possession of the young master! Do you remember ceaser? In one of episodes of smiley, you could see him eating a giant candy that made him turn to purple, near him there is a wagon that soldiers wanted to ride, but it started melting. Moreover, at the wagon there is a bag full of apples and one of them turned into purple, I think it's a devil fruit, but I don't know who it's user is. The devil fruit was smiley devil fruit because when ever a devil fruit eater died the devil fruit will be reborn to nearby fruit that is how the apple became a devil fruit in episode 602 in one piece. How long does Devil Fruit take to re-spawn after the death of user? Are Awakened Zoan users able to change form?